Make every meal a journey to a far-off land and enchant friends and family with delicious home-cooked meals. 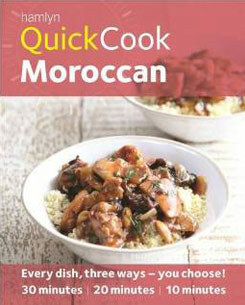 From soups and tagines to saffron-scented delicacies and pastries, Hamlyn QuickCook:Moroccanfeatures authentic recipes for making Kebabs, Couscous, K’dras and Tagines, as well as delicious ideas for those with a sweet tooth, from fragrant Rosewater milk pudding to luscious Creamy figs with cinnamon honey. Beautiful photographs and clear instructions make this book perfect for cooks at all ability levels. Appealing to novice and experienced cooks alike, the QuickCook books provide something for everyone. And to make life even easier, you can use the special code on each recipe page to email yourself a recipe card for printing, or email a text-only shopping list to your phone. With 360 delicious recipes in each book to choose from, you can dial a dish up or down to meet your needs – there’s something for everyone!